The Fluval edge nano tank is a sleek looking modern fish tank. Its available in 2 sizes, 23 litres and 46 litres in both black and white. It’s interesting design give the impression that it’s floating about the surface it’s placed on. With the right additions to the tank you can keep this modern theme going to create a fanatic looking tank. The 46 litre option gives you a wider choice of design and its depth means you can create an effective look with a mix of lower swimming fish (like neons or any tetras) and surface swimmers (like guppys). This gives a vision of fish through the tank and makes the tank come alive with colour. Its a great tank for brightening up the corner of a room and makes a real statement when planted and stock correctly. Additional heater cables will go through the back section too. Day night lights give a different look when changed to blue in the evening. Opening of the tank so limited which makes the initial setup tricky. Has a holed cover and needs regular water adding (1 beaker a week roughly) to stop the running water getting to loud or disturbing the stones. No timer for the lights mean they have to be switched from day to night manually every day. The Fluval edge is a fantastic small aquarium for the modern home or office. Obviously the colour choice codes down to you personally, below shows the different options available – click on the image to see the product on Amazon. The size of the tank depends on the space you have for it with the 46 litre one being much taller than the 23 litre option. The 23 litre is great as a starter tank or shrimp tank, the larger tank is still fine as a starter or shrimp tank but gives you more options with the design and you can stock more fish. When you first setup the Fluval edge you need to have a plan for how you want it to look as the initial work is key to a good looking aquarium. Starting with the gravel or sub-trait colour for the look you’re going for. The Fluval edge comes in black or white so select the option you require. Both look good with a dark gravel and if you’re having a planted aquarium then you’ll need a decent depth. The next thing to consider is the setup of stones, plants or ornaments. As mentioned in the cons the hole to put these in is smaller than the dimensions of the tank so you need to make sure you can fit everything through. With the filter running water in from the back it’s best to not directly block the middle back of the tank so the water flows well. The tank looks really good with a central feature or one off set to the left or right – like a cliff face look for example. This means the fish swim out in the open water and the shrimp will scurry in and out of the feature looking for food. If possible you can build a nice rock feature over a shrimp house like below then you may get the shrimp to breed. This can then have Java moss other plans added around it and in the gaps to create a natural look. 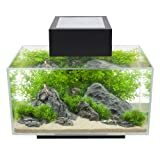 Or us this as the base to add the rocks over it for a really natural shrimp home . I have this setup in one of my tanks where I took this shrimp house and used Jewel conexo glue to stick on rocks with Java moss on and used bamboo canes with Java moss over the entrance. My shrimp absolutely love this home and its always covered in small shrimp. It only takes a few minutes to get clean and sparkling again which is a good thing. The 46L tank is easier to get in and clean as its a good depth, but it’s still not as simple as the Fluval Flex tank. There are some dedicated accessories for this tank that will help with the cleaning – these are designed to make it easier with the small opening. Gravel Cleaner (Buy here) – This is great for keeping the bottom of the tank clean of you don’t have a plant carpet. Replacement filter cartridges (Buy here) Your fliter media will need replacing every 6 months to 1 year depending on what you keep in the tank. Over all the tank is stunning to look at and there’s no other tank like it on the market. It does have its challenges in terms of design and upkeep and we’d recommend the 46L version. You’d struggle to find a more contemporary tank and if thats what you are looking for then this is the absolute best tank for you. *Please note these are not our setups, just ones we’ve seen and we try our best to reference the designer where possible. I really like how the clean white sand sets off agains the dark bog wood with just a few plants in for effect. This is a really effective design in the space and keeps the contemporary feel without too much maintenance. Fluval make a couple of dedicated accessories for the Edge tank. You can use these to keep the very Sharp look of the tank if you prefer a clearer tank. Whilst you may not think that this is key, trust us – this is something you’ll need if you’re not having a planted bottom! This cleaner really helps you with getting into the corners of the tank, due to its small hole this can be a little tricky at times! Please could you tell me what’s a top hole dimension in 23l one? Hi, sorry for the delayed reply – I’ve only just noticed this. The hole at the top is approximately 17 cm wide and 12.5cm deep. Depending on what you’re planning to put in, decorations wise, you can get longer objects in by sliding them but it depends on the depth of the object to see if they will fit. What is the size of bottom stand for the tank ? Very big dissapointed for me! Im really mean the before version was stronger light…. this one only 3,5Watt enought for nthing! I think the tank is more about style than a perfect aquarium. It suits a certain environment – For a more suitable tank check out my review of the Fluval Flex.